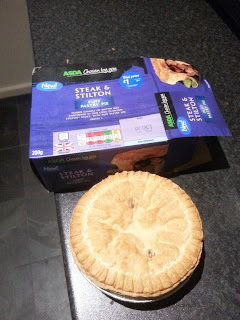 Pierate - Pie Reviews: Stick some steak in that stilton, ASDA! My local ASDA appears to have massively boosted its pie selection recently - perhaps they knew a Pierateer had just moved close by? But while I was so pleased to see such a selection of pies on offer, this also had me worried. Have ASDA compromised on quality for the sake of quantity? If they now offer so many pies, can they really have tried and perfected them all? Pie lovers, cover your eyes! I'm about to show you a picture which I think is so shocking it will give you nightmares for weeks. Remember, what is seen cannot be unseen. I'll put it as small thumbnail to give you a taste of the horror - click for the bigger picture if you dare. I found this Steak and Stilton pie chilling on the shelves, so I picked it up (along with four other pies...) for the low low trial price of £1 (I believe the normal price will be £1.50). What a bargain! How do they sell them for just £1? How is that even possible? 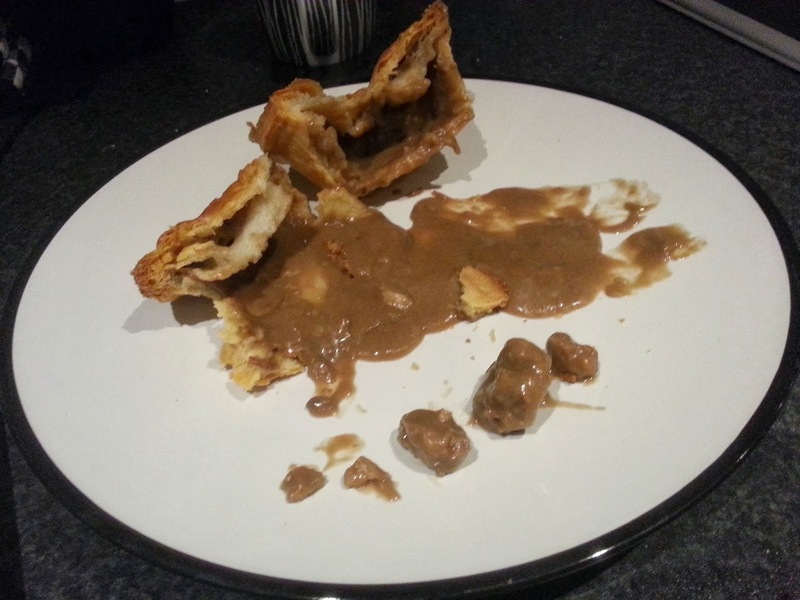 As you can see from the photo above, the pie had taken on a lovely pie colour after cooking. 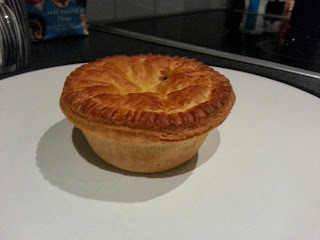 The puff pastry had puffed nicely, although this still has the appearance of a standard mass-produced supermarket pie. It doesn't look very exciting. Upon cracking open the pie, the contents are even more underwhelming. A tidal wave of gravy splurged out of the pie and formed a gravy pool on the plate. To me it seemed the pie was essentially a balloon of gravy which I had just burst. Pool of gravy - where's the steak? Yes, that's it. And bearing in mind that this pie was quite small, I don't think this picture actually quite does justice to how small those small bits of steak are. I'd count only two actual 'chunks' of steak - the remaining three morsels of beef were, in my view, pretty much just a few strands of beef lumped together. To me, this lack of steak and overly-liquid content of the pie was highly underwhelming. The content and capacity of this pie was therefore significantly lacking. The two bits of steak weren't too chewy, although not of great quality, I felt. 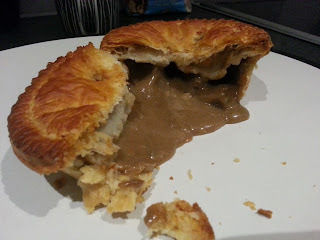 The sauce did taste nice - as I've mentioned before in my review of the Higgidy Steak and Stilton pie, I am a fan of stilton. Overall, I think this is a bit of a shocker here from ASDA. I suppose I should have suspected that much for £1, though.